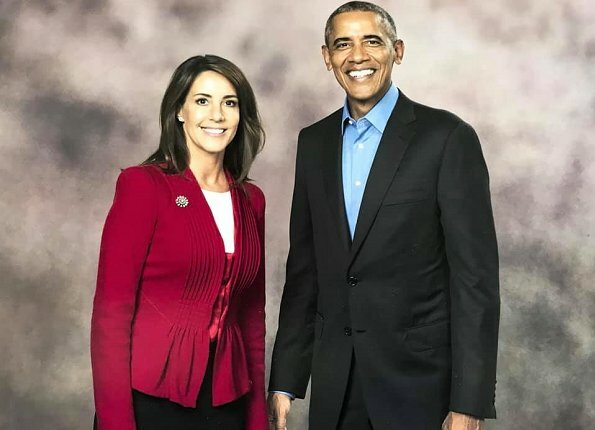 On September 28, 2018, Princess Marie attended "A Conversation with President Barack Obama" event held at the university park of South Denmark University (SDU) in Kolding. Former President Barack Obama took to the podium as a guest speaker at SDU in Kolding. The event was held in collaboration with Kolding Municipality and Business Kolding. The event hosted 200 invited students and other invited guests. 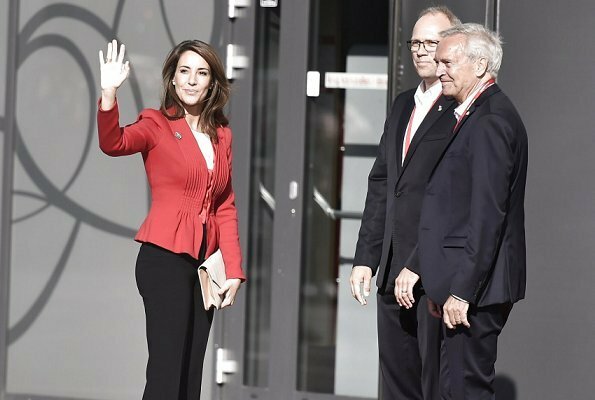 (Princess Marie wore a red jacket by Giorgio Armani, which she had worn before). I thought this was a royal fashion site. Why the pic with Obama, no royal with him? To the point, I think Marie looks lovely here. The jacket is great. Don't be ridiculous.Black trousers and red jaclet,impecable. 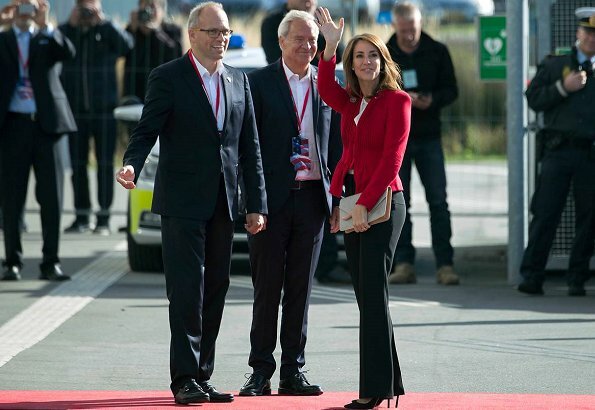 Princess Marie looks amazing .I like the color of the jacket with the black trousers and her hair style .She has a charming beauty. Excuse me, but why the last picture of just Obama without the Princess or any woman at all in that picture? He has nothing to do with fashion, only politics. I come to this site to see what royalty wears and to get away from politics. He is not royalty. I agree. Marie looks nice. Nobody wants to see him. Marie's outfit is elegant and understated to listen to a lecture, especially since it was attend by many students and working people as the information provided states. Ms. Electra always tries to give us the context in which the royal is wearing the outfit, whether it is gala, charity or inspirational. In this instance Marie is an inert member of the crowd there to listen and not participate. She could have left without the Obama photo op but got a picture like any other celebrity watcher. These things do have to be posted as work on the royal website. Many royals have had their picture taken with Mr. Obama (even prince George), and they are supposed to be a-political. It's simply the context of the event. There was objection to the picture of just Obama. When the Spanish royals or Jordanian royals visited the White House there was no picture of Trump by himself. Same is true with the visit to Queen Elizabeth. If this is about royal fashion, no need for single picture of non-royal leader. True, but rigid thinking takes the fun out of many things. It would have been polite to ignore the single pic and refer only to Marie. This is the blogger's work. She may be a fan of Mr. Obama..and in an egalitarian world we are all royal. Thank you for removing the picture of Obama by himself. We appreciate you keeping this website about fashion. Wow Diane was completely right about some of the people on this blog. I do not understand why some of you are so agressive. Just forget Obama and focus on Marie.......she is just lovely and I parcularly like her shoes. Have a nice week-end everybody! I also agree, Obama is not so disturbing, as long as his messages do not appear. I see no reason to be excited about it. Mary's hair is flat and not right for her very narrow face. 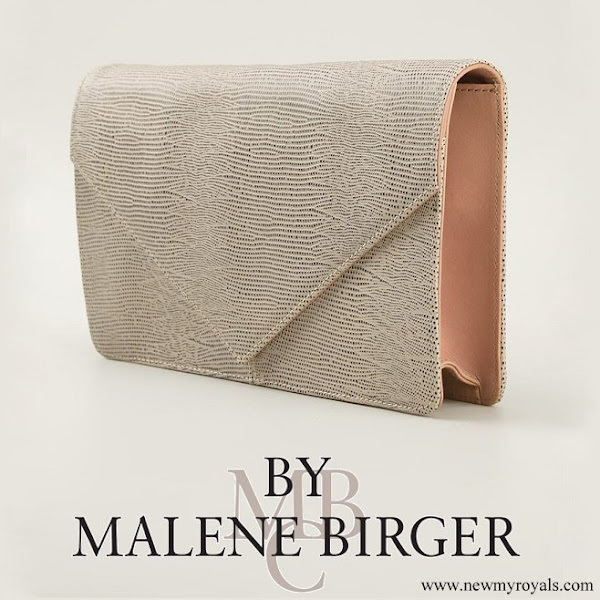 I hope she will find more suitable and modern style. Obama looks handsome as always. I see nothing wrong with her hair style, it is typically hers. 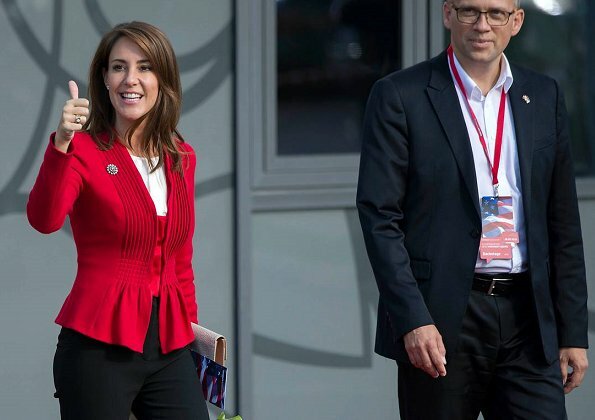 I must say that I am most jealous of Princess Marie here, not only did she get to meet one of the most charismatic and interesting leaders of our time, she also looks fantastic in her red jacket. Obama looks perfect in his suit as well, BTW. Thank goodness for diversity and tolerance. Right? Did it hurt anyone to see a picture of a recognized personality who attended the same event? One would think that some of us might forget (way more so than the blog publisher herself - great job, btw) that everyone is entitled to post content that is civilized and appropriate. Suggest that those who feel such strong indignation strart their own and decide what belongs and what not. Seems more decent than lashing and politicizing a simple photo from the event. Regardless of personal inclination, these unusual comments and not the single one photo change the tone and scope of this blog. Which brings me back to Marie’s outfit. Nice, classy and unassuming. Well fitting and I would suggest likely to make her comfortable. I have lots of admiration for her. Seems a strong and confident lady.